Professor of Photography Michael Chovan-Dalton, the creator and co-host of "thePhotoShow." Photo by Kai McBride. ThePhotoShow went live in December at The School of Visual Arts. 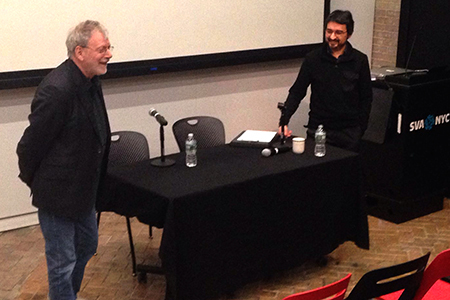 Michael Chovan-Dalton, right, is pictured with director Martin Bell during a Q&A following the screening of Bell's documentary. Photo by Lucas Thorpe. West Windsor, N.J. – Professor Michael Chovan-Dalton, coordinator of the Photography and Digital Imaging program at Mercer County Community College (MCCC), is as busy in his time off campus as he is in the classroom. 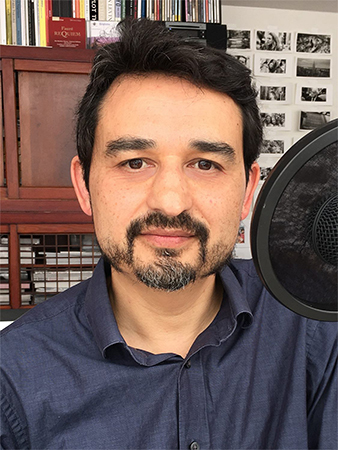 Chovan-Dalton is the creator of thePhotoShow, a podcast he co-hosts with Kai McBride, a photo professor and manager of photography facilities at the School of the Arts at Columbia University. The School of Visual Arts (SVA) in New York City, where Chovan-Dalton earned his BFA, and Charles Traub, the chair of SVA’s Photo and Video Graduate Program, have been key sponsors of the project, providing the hosts with recording facilities and a base of eager listeners that keeps on growing. The inaugural episode of thePhotoShow aired in July 2015 and, 37 episodes later, the hosts show no signs of slowing things down. Chovan-Dalton sees the podcasts as a way for the photography community to communicate and grow. “The show is a means to connect and reconnect with photographers I have known and to expand that community to include new photographers,” he explains. Chovan-Dalton and McBride book all the guests, who have welcomed the show’s conversational format. While the hosts conduct background research on their guests, there is no formal script. “We let the guests go in any direction or expand upon any idea. We basically record until we all feel like we have said what we wanted to say without trying to invent something,” he said. In December, for the very first time, the show was recorded before a live audience at SVA. Chovan-Dalton moderated a screening and Q&A session with director Martin Bell about the documentary “Tiny: The Life of Erin Blackwell,” a film Bell made with his wife, acclaimed photographer Mary Ellen Mark, prior to her death last year. Chovan-Dalton reports that the live event went well. “We had a good-sized crowd. The audience was very engaged and asked some great questions after the screening,” he said. While he has enjoyed his conversations with all of his guests, Chovan-Dalton said it has been especially gratifying to speak with some of his mentors and people whose work he has admired for a long time, such as Thomas Roma, Charles Traub and Susan Kismaric. While his students are not required to tune in, they certainly benefit if they do. Chovan-Dalton often references the podcasts in his History of Photography (PHO 110) course. “I am constantly learning new things about historical and contemporary photography. My guests personally knew the photographers, directors, curators and gallerists who made or are making history, or they themselves are direct sources being included in the history books,” he notes. Several MCCC students have been intrigued enough by thePhotoShow to want to become more than just regular listeners. “I have a current and a former student who are both interested in working with me,” Chovan-Dalton said. In addition to his BFA from the School of Visual Arts, Chovan-Dalton earned his MFA from Columbia University. Episodes of thePhotoShow are available here.